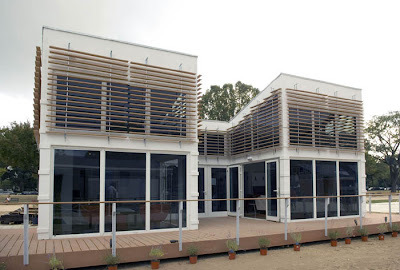 Today all the participating studios --in architecture, landscape and interior design visited Engawa, the FIU 2005 Solar Decathlon house. Amazing to think that students designed and built this! Can't wait for us to build one, too. The 2005 house now resides in the College of Engineering Campus as a Sustainable Design laboratory. 'Engawa' is a Japanese word meaning unity between inside and outside. FIU won first place in the Energy Balance competition that year. Professor Zhu gave us all a tour through the house and explained the ideas behind the first FIU Decathlon project. J005 we brought the Engawa house to Washington and won first place in the Energy Balance Competition. “Engawa” is a Japanese architectural term meaning a unity between the interior and exterior. This is exemplified by the simplicity of the plan and the glass façade, which can be opened to create a unified living space. 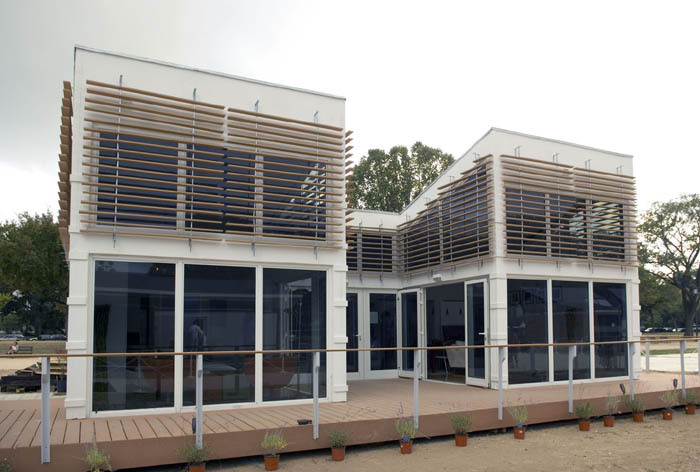 We just found out that FIU is one of 45 schools from around the world invited to continue to Stage 2 of the U.S. Department of Energy 2011 Solar Decathlon Competition. NOW, it's beginning to feel like a race: It's a design project! We have until next March to design an innovative, affordable, beautiful solar house that represents Miami (our city), South Florida (our region), and FIU --our university! Graduate Design 9 is dedicated entirely to sustainable design, so it's the perfect place in the architecture curriculum for Decathlon: Professor Nepomechie is coordinating Grad 9 this year. Students in all 3 Grad 9 studio sections are invited to participate an internal design competition to find the best possible proposal. We've also invited students in many other departments to join us on Team FIU. We need everyone's expertise! Welcome to new friends in Landscape Architecture, Interior Design, Civil/ Environmental, Mechanical, Electrical and Computer Engineering as well as Construction Management... !